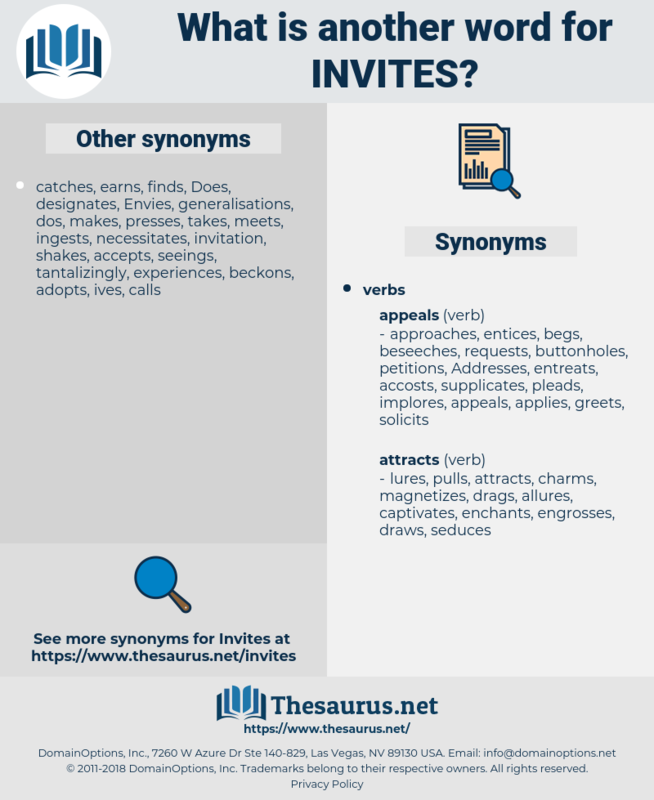 What is another word for invites? reiterates, complaint, at, for, require, on, From, claim. applicants, submissions, claims, applications, demands, seeks. recipient, reception, accepting, Receiving, requisition, solicit, encouraged, applicant, acceptance, parliament, welcomes, invitation, receive, committee, Applying, accept, receipt, supports, accepts, submission, Urged, acceptable, application, applications, demand, demands, engages, seeks, accepted, reference, committed, promotes, demande, Claiming, commits, may, assembly, EACA, apply, RFI, -lsb-, claim. instructions, instructs, advocates, entail, applicants, stimulates, ask, recommends, reiterates, Hires, exhorts, submissions, wishes, Inquiries, expects, directs, incurs, offers, leaders, presses, fosters, expresses, draws, requires, reasons, hopes, needs, grounds, claims, welcomes, Applying, supports, applications, demands, seeks, promotes, commits. hired, commissioned, sought, Appealed, called, drew, encouraged, Urged. welcoming, prompting, seeking, challenging, Soliciting, buying. initiates, incites, invitations, necessitates, motivates, indicates, involves, contributes, Institutes, facilitates, sends, introduces, generates, presents, insists, notes, associates, inspires, envisions, convenes, suggests, entails, requirements, stipulates, solicits, proposes, recruit, recruits, enters, elicits, determines, visiting, combines, provokes, induces, attracts, enjoins, receives, tells, undertake, undertakes, highlights, creates, begins, Gives, brings, prevails, helps, binds, prompts, publishes, warns, prays, awaits, employs, pledge, pledges, refers, enables, enhances, concludes, advocates, challenges, throws, agrees, proceeds, is, begs, poses, describes, favors, bids, covering, covers, leads, finds, allows, arouses, Cries, wants, launches, pursues, favours, applies, onwards, stimulates, causes, provides, Has, releases, takes, raises, recommends, reiterates, Hires, exhorts, approaches, starts, buys, says, wishes, expects, directs, puts, incurs, gets, shows, offers, fosters, draws, requires, hopes, needs, spurs, claims, makes, welcomes, supports, accepts, application, demands, engages, seeks, promotes, commits. That is the entertainment to which this bill invites us. Expect me to pull my freight at the say - so of the first stranger that blows in an' invites me to hand him my job?